Many who seek to perfect the use of the bow sometimes pursue the path of the arcane archer. Arcane archers are masters of ranged combat, as they possess the ability to strike at targets with unerring accuracy and can imbue their arrows with powerful spells. Arrows fired by arcane archers fly at weird and uncanny angles to strike at foes around corners, and can pass through solid objects to hit enemies that cower behind such cover. At the height of their power, arcane archers can fell even the most powerful foes with a single, deadly shot. Those who have trained as both rangers and wizards excel as arcane archers, although other multiclass combinations are not unheard of. Arcane archers may be found wherever elves travel, but not all are allies of the elves. Many, particularly half-elven arcane archers, use elven traditions solely for their own gain, or worse, against the elves whose very traditions they adhere to. Role: Arcane archers deal death from afar, winnowing down opponents while their allies rush into hand-to-hand combat. With their capacity to unleash hails of arrows on the enemy, they represent the pinnacle of ranged combat. Alignment: Arcane archers can be of any alignment. 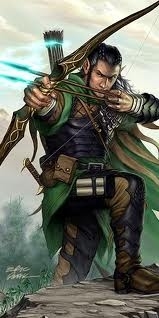 Elf or half-elf arcane archers tend to be free-spirited and are rarely lawful. Similarly, it is uncommon for elven arcane archers to be evil, and overall the path of the arcane archer is more often pursued by good or neutral characters. To qualify to become an arcane archer, a character must fulfill all the following criteria. Feats: Point Blank Shot, Precise Shot, Weapon Focus (longbow or shortbow). Spells: Ability to cast 1st-level arcane or divine spells. The arcane archer's class skills (and the key ability for each skill) are Perception (Wis), Ride (Dex), Stealth (Dex), and Survival (Wis). All of the following are class features of the arcane archer prestige class. Weapon and Armor Proficiency: An arcane archer is proficient with all simple and martial weapons, light armor, medium armor, and shields. At the indicated levels, an arcane archer gains new spells per day as if he had also gained a level in an arcane or divine spellcasting class he belonged to before adding the prestige class. He does not, however, gain other benefits a character of that class would have gained, except for additional spells per day or mana points, and an increased effective level of spellcasting. If a character had more than one arcane spellcasting class before becoming an arcane archer, he must decide to which class he adds the new level for purposes of determining spells per day. At 1st level, you gain the feat Critical Focus. At 1st level, every non-magical arrow fired by an arcane archer gains one of the following elemental themed weapon qualities: flaming, frost, or shock. At 5th level, every non-magical arrow fired by an arcane archer gains one of the following elemental burst weapon qualities: flaming burst, icy burst, orshocking burst, as well you can take a move action to enchant arrows to make them exploding arrows. In addition you may choose to charge the arrow with additional elemental energy and deal damage to all creatures within 5' +5' /2 lvls the Arcane Archer hits. The blast deals 1d6 points of damage for every two of levels of Arcane Archer. A creature not hit but in the area of the explosion is allowed a Reflex save(DC10+1/2 lvl+ you main casting ability modifier), for half damage. Misses have no effect. You can enchant one arrow per 5 mana points. The enchantment last 1 round. Arrows used in this way can't be recovered. At 8th level enemies effected must make a fort save DC10+ 1/2 your level or be dazed for 1d2 rounds. At 3rd level, you gain the feat Deflect Arrows. At 4th level, an arcane archer can launch an arrow at a target known to him within range, and the arrow travels to the target, even around corners. Only an unavoidable obstacle or the limit of the arrow's range prevents the arrow's flight. This ability negates cover and concealment modifiers, but otherwise the attack is rolled normally. Using this ability is a standard action (and shooting the arrow is part of the action). An arcane archer can use this ability once per day at 4th level, and one additional time per day for every two levels beyond 4th, to a maximum of four times per day at 10th level. At 6th level, an arcane archer can launch an arrow once per day at a target known to him within range, and the arrow travels to the target in a straight path, passing through any nonmagical barrier or wall in its way. (Any magical barrier stops the arrow.) This ability negates cover, concealment, armor, and shield modifiers, but otherwise the attack is rolled normally. Using this ability is a standard action (and shooting the arrow is part of the action). An arcane archer can use this ability once per day at 6th level, and one additional time per day for every two levels beyond 6th, to a maximum of three times per day at 10th level. At 6th level, you can use a move action to create an aura that extends 30' all around you. All projectiles or thrown missiles coming within this aura literally slow in flight. All allies in this aura receive a +4 dodge bonus to their AC. Any enchanted missile (including magic missile) must make a successful saving or be dispelled. The DC is based on the Arcane Archer's caster level. The aura last 1rnd / 2lvs of Arcane Archer. To activate the aura costs 5 mana points. In lieu of his regular attacks, once per day an arcane archer of 8th level or higher can fire an arrow at each and every target within range, to a maximum of one target for every arcane archer level she has earned. Each attack uses the archer's primary attack bonus, and each enemy may only be targeted by a single arrow. You can take a move action to enchant arrows that when fired will split into multiple arrows. The arrow splits into 3 arrows in flight, allowing 3 attack rolls against different foes. Each arrows chance to hit suffers a -2 penalty. You can enchant one arrow per 3 mana points. The enchantment last 1 round. Arrows used in this way can't be recovered. These arrows can be aligned but cannot be stacked with energy arrow or elemental themes. At 9th level, With this ability you are able to divine the weak points of your targets. When using ranged weapon, you ignore 1 point of of your targets AC for every 2 levels of Arcane Archer( shields and natural armor are counted as armor for this purpose but not magic armor). To activate this ability costs 7 mana points and lasts 1 rnd per 3 lvls of Arcane Archer. At 10th level, you can take a move action to enchant arrows to charge them with magical or divine energy and can actually drive missiles through the bodies of opponents, and into opponents behind them. When this arrow strikes the first opponent you make another attack as a free action against all foes within 10' / 1/2 level in a straight line behind the first opponent. The attack bonus of each consecutive attack is at -5 per foe hit. The missile does not stop until it hits a sold inamninate object or it reaches its maximum range. You can enchant one arrow per 11 mana points. The enchantment last 1 round. Arrows used in this way can't be recovered. At 10th level, an arcane archer can create a special type of slaying arrow that forces the target, if damaged by the arrow's attack, to make a Fortitude save or be slain immediately. The DC of this save is equal to 20 + the arcane archer's Charisma modifier. It takes 1 day to make a slaying arrow, and the arrow only functions for the arcane archer who created it. The slaying arrow lasts no longer than 1 year, and the archer can only have one such arrow in existence at a time.